Glass bead shot peening is widely used to finish metal surface in order to increase the wear properties of complex shapes, such as gears. Glass bead shot peening is used to provide a clean, bright satin finish for thin walled parts or thin welds. 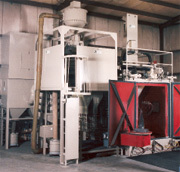 Engineered Abrasives® manufactures a full line of custom shot peening equipment for use with glass bead media. Our shot peening equipment is designed and manufactured to meet your exact production requirements for precise finishing of complex metal parts. Engineered Abrasives® manufactures indexing tables that offer high volume, high quality finishing of complex parts. Using multiple stations with custom parts holders and flexible loading and unloading capabilities, our precision blasting tables provide efficient blasting for precise finishes. Ideal for light to medium volume precision blasting applications, our single cell machines provide effective blasting for complex parts. Designed to process parts from small gears to large aerospace parts, they can be integrated into cell manufacturing processes for greater efficiency. We manufacture custom specialty equipment to meet unique manufacturing requirements, including single cell and custom blasting cabinets to accommodate multiple part sizes and configurations. In addition, we offer cabinets with single swing, double swing or counterbalanced doors. Our continuous blast tables with 360-degree rotating heads are ideal for high volume blasting operations. The 360-rotating head ensures an even, uniform finish on all surfaces of the part. All our custom glass bead peening equipment is designed and manufactured to meet the most stringent performance requirements and to meet your exact production requirements. Our knowledgeable, skilled staff will make sure that your custom equipment will provide the performance you require.